Availability Note: The copy I have was acquired by a friend at the 2018 fall Game Market, but at the time of this review, copies are available from bodoge.hoobby (transship service such as Tenso required). When I’m old, I’ll eat pizza on Fridays. It has a name in my life: Pizza Fridays. It also has a black twist: it starts when my wife dies. I try to make it to the gym 3 or 4 days a week. I often don’t because things come up. It’s important to me, but y’all: so are many other things. The weekends are when I succeed. Weekdays inevitably come down to making it once or twice, but if I can make it on Saturday and Sunday, I’m likely to hit my 3 or 4. I don’t do it to lose weight or build muscle or really anything too specific, other than trying to die later than I otherwise would. I go as preventative maintenance. Medicine. It makes for some interesting dynamics while I’m there. In the meantime, I sometimes make guacamole with bananas instead of avocados because of a Shopsin twist on a Carlin joke. Shopsin puts eggs in most everything, including as pizza crust. It’s like a broiled open-face omelet with marinara. I ate that frequently years ago. Might have been every night. I have a complicated relationship with pizza. Anyway, in PPDGttGT, the players are pizza deliverers attempting to complete deliveries in a ghost town. But, here’s the thing. The ghosts that live in the pitch dark ghost town like to play pranks, like stealing your pizzas. So you, the psychic deliverers, attempt to use your powers of perception to find the pizzas, fight the ghosts, and get the pizzas delivered. In 20 minutes. Otherwise the pizza is free and you lose. Well, all but one player. One player is the Mayor of the ghost town who designs the town prior to the start of the game and operates as a sort of game master. The Mayor will win if none of the pizzas are delivered in 20 minutes. Among the deliverers, the game is competitive, with the first player to deliver their pizza emerging victorious. The deliverers will start the game with a pen/pencil, a meeple to indicate their color, 2 starting psychic power cards, and what amounts to a blank sheet of graph paper. The deliverers rotate taking turns, with three actions available each turn: move, attack, use a psychic power. As part of these actions, the Mayor will tell the players what happened, and after any of these actions, the Mayor will tell the players of the deliverer’s surroundings. 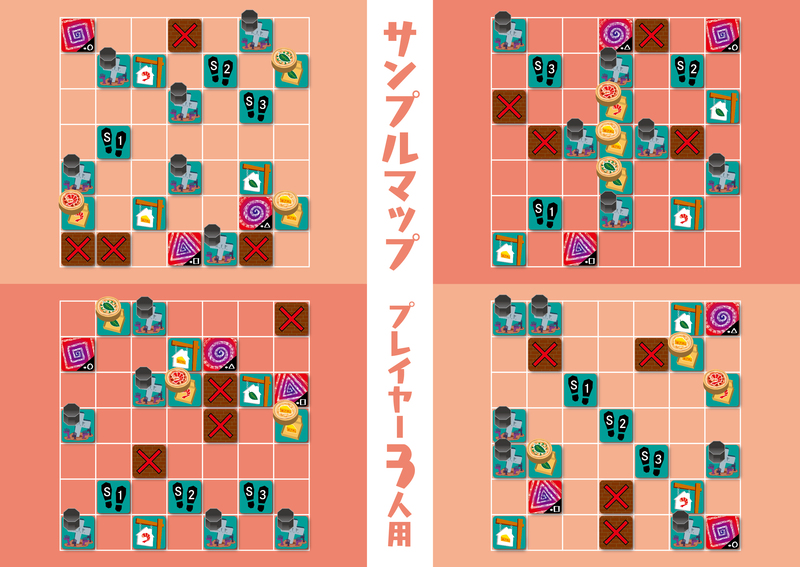 For moving, a player chooses an orthogonally adjacent space and specifies in which direction they would like to move. The Mayor consults the map and either indicates that the deliverer may not move there (e.g. “You cannot move south; that is a wall”), or moves the player and indicates what, if anything is there (e.g. “You have found a pizza!” or “You have been teleported!”). If the tiles does not have a piece of wood in it (e.g. pizza, ghost, or house), the Mayor will declare the tile as being empty, and the deliverer will not know if they have walked on an empty pizza box, starting location, or empty graveyard. Each deliverer may pick up one pizza, and when they do, the Mayor adds the corresponding house token to the house tile; the Mayor also adds a ghost to each of the 8 tiles surrounding the house which does not contain a token or a tile. If a player attempts to move to a space where there’s a ghost, the Mayor declares that they cannot, as there is a ghost there. However, on a future turn, the player can choose to attack an orthogonally adjacent square (perhaps that one with the ghost, though you could reach out blindly.) If there is a ghost in that square, the Mayor will remove it from the board and the deliverer gains a psychic card. Rather than moving or attacking, a player could also use a psychic card. These generally allow a player to move in more exotic ways: diagonally one space or diagonally as far as possible (jumping over any walls or other obstacles) or returning to the starting location and then gaining a free move/attack. If the card would land the deliverer in the same location as a ghost, the ghost is removed by the Mayor without a word to the players. After any of these options, the Mayor lets the deliverer know what is around them -and the other players are certainly welcome to eavesdrop. 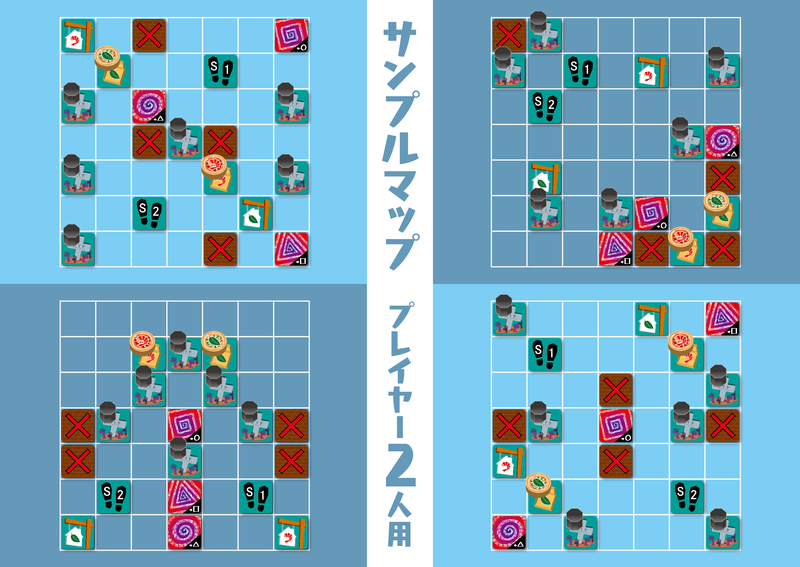 Specifically, the Mayor will tell the player about any orthogonally adjacent walls (either the edge of the board or one of the dead spaces -there is no distinction) (e.g. “There is a wall to the West of you”) and any wooden pieces in the 8 surrounding squares, other than your fellow deliverers (e.g. “There is at least one house and at least one ghost in your surroundings.”) In this way, the Mayor does not deliver any information on the number of ghosts, pizzas, or houses, or their location. The Mayor records the deliverers’ moves on a sheet, for, as the rules state, “post mortem” purposes, and the deliverers record their attempts to map out the ghost town on the provided graph paper. The game also includes a sheet of round tokens for playing variants that introduce pigs, a monkey, a crow, manhole covers and other things. Wow. That doesn’t sound like it could work. But I think it does! What strikes me as I attempt to coalesce my thoughts on the game, is that it lends itself more to session reports than it does to a review. My mind doesn’t draw threads between games: it focuses on the drama of the specific games. The time this happened and that happened. When Jason couldn’t move because of a ghost, so tried to attack in the next turn – only to find that it was no longer there as another player had attacked it in the meantime, but neither realized they were in each other’s vicinity. When I attempted to hop in and out of the teleporters to expedite my trip to the Cheesy Pizza House, but didn’t quite realize that they were close enough to each other that walking would’ve been faster. When Aaron and Ryan were exploring the same area and didn’t realize it. When I assumed the map was rotationally symmetric, and swung for the fences with the 180-degree-rotate special move…not realizing I was in the dead center of the board and didn’t move at all. It’s part of what makes the game so fun to play as the Mayor: getting to watch the drama unfold. Some of you might think this is a 40 minute game with 40 seconds of highlights. It is a thing that can happen that you wander in the dark without the slightest hint of pizza in the air. Maybe it happens again next game too. Eh, potato, potato. For me, the deduction is there and has the right arc. Count the walls and the ghosts. Save your cards for the right moment. Hire a good radio operator. It seems odd when you explain the game and say that the Mayor takes notes, as the rules say, for the “post mortem”, but it’s true. It’s valuable to have the Mayor as the game’s secretary of sorts so that you can have a replay and highlights show afterwards. The scenarios for the town blueprint are fun. I’m not going to explain all the ways, as some of them I would consider spoilers. Also fun: when the Mayor designs the town, then the post mortem includes an interesting discussion of the deception and trickery that they had planned and how that worked out. In addition to tweets that I see, I do most of my Game Market research through the gamemarket.jp site, as it has a news feed of sorts on the front page with fairly thorough information on the games that will be released. PPDGttGT first came across my radar through a banner ad on the Game Market site, but it wasn’t yet in the database (inclusive of gamemarket, bodoge.hoobby, and bgg). The ad showed the box cover, which was the same cover as the game has now (with a title in English and Japanese), but at the time the English name was “Esper pizza deliveryman coming to the ghost town.” Esper? Could that mean “ESPer” as a way of saying psychic? I’m glad I took a flyer on this one. I don’t rank games, but I’m comfortable acknowledging tiers. This is a top tier 2018 game for me. Dale Y: I do not limit myself to pizza every Friday (which my waistline will readily attest to). I eat it when it sounds good. I also prefer my games with fun and not blind stumbling around. I have a standing policy to have an open mind about games and to try just about anything that anyone in my group(s) wants to play. I probably draw the line at outright RPGs, anything with a play time greater than 3 hours, and Cthulhu games. But, short of that, I’m game for anything. So, I played this one when JaNate brought it out. I often like deduction games, but this one fell short for me as a delivery person. It might be my own shortcoming at not being able to accurately track the information. (I have since seen that others – well James Nathan – are able to somewhat come up with a plan that works). But for me, it was 17 or so turns of kinda guessing where I was at, and then I managed to win because of some dumb luck and a fortuitously placed transporter. The game is a little bit more enjoyable as the Mayor because, for me, it’s more fun to watch other people stumble around blindly than being the stumbler. It also leaves my hands more free to eat pizza while they play. I have only been Mayor once, and I used one of the pre-printed scenarios, but I definitely enjoyed that role more than the pizza delivery person.. It might be even more fun to construct a town and see how the delivery people fare with it. If I play this again as a delivery person, I’ll probably only play with a full roster of players. I’ve watched it with two delivery people, and frankly, there isn’t enough information. For me, I’ll need two other people stumbling around to give me enough collateral information to try to build a map. I’ll more likely only want to play as the Mayor though. Which means I’m not really playing, but rather facilitating the “fun” of others – but at least I won’t end up frustrated that way. I think that there are definitely people there who will like this. I have truly seen the joy that it brings James Nathan. And, I can appreciate that. But like cilantro, this is one of those things that other people enjoy but tastes like soap in my mouth. I mean, some people like the way rhubarb tastes too – but that’s generally not for me either. And I’ve read somewhere that making a rice pudding dish with Oreos is a thing… ( https://thetiptoefairy.com/oreo-rice/ or http://www.topbilling.com/articles/Oreo-Rice-Pudding.html?articleID=2844 ) That might still get tried at some point. Yet, for all those things, there are some who can’t figure out at all what might be appealing about it. And, if you are wondering, if James Nathan dies first, I will NOT play this game every Friday. But I will gladly eat his share of pizza.